Admiring the vastness of the Sahara just outside Chinguetti, northern Mauritania. Yui, tell us something about your early years and how your interest in travel developed. Travel has been part of my life for as long as I can remember. I was born in Singapore and educated in the US, then lived in Japan before moving to the UK. With a pilot father and a scuba-diving mother, it was perhaps inevitable that I would become interested in travel. My parents were generous with vacations and thanks to them I was able to experience the world from an early age. Family trips included a variety of experiences, from the Komodo dragons in Indonesia, to volcanoes in Hawaii, or island hopping in the Maldives. As a child, I enjoyed looking through old issues of National Geographic in my dad's study. One particular memory I have is of being fascinated by a photo spread featuring the Sunday Market in Kashgar. Although at the time I knew nothing of the place, it looked so exotic and unlike anything I had ever seen. I was probably too young then to properly grasp the concept of travel, but I remember being filled with a sense of wonder as I gazed at the pictures and feeling a deep urge to explore the world and see places like that with my own eyes. 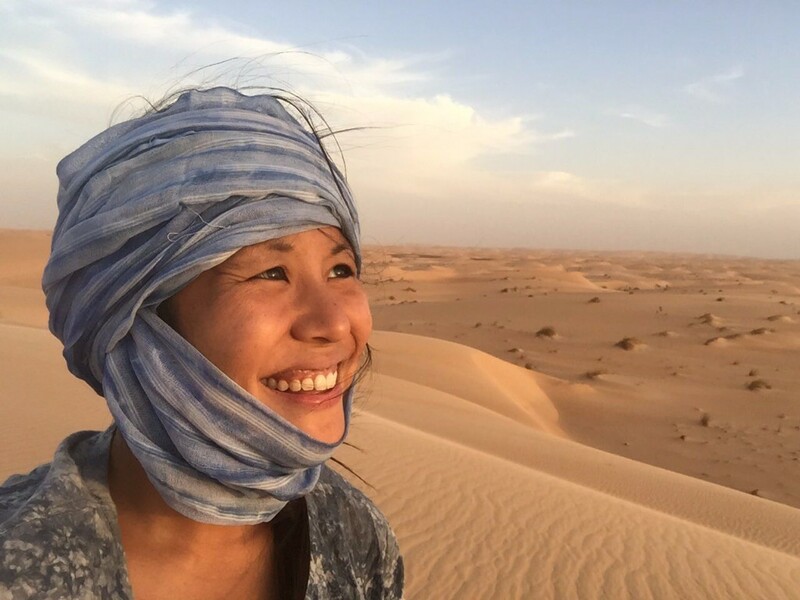 You are the only Asian woman we know of who has been to every world country. What was your motivation and how does this distinction make you feel? Wow, I wasn't aware of this distinction. But now that I know, I feel pretty proud. The truth is that I never imagined I’d be able to visit every country. When you first start, the world seems like such a big place. In my 20s, I had more modest goals like “visit 40 countries by the time I'm 30". But once I’d surpassed them and my travels continued over the years, I forgot about counting for a long time. Accessing all the countries seemed so unlikely that I hadn’t really considered it. I focused instead on seeking out unique experiences, combining travel with my work and research, and making each trip meaningful. I stuck initially to the beaten track, but then I started wondering...what else was out there? What knowledge and experiences was I missing out on by not going there? And eventually it came to a point where I realized that my jigsaw of the world wouldn't be complete without the missing pieces. One day, a conversation with some seasoned travellers I’d met on the road inspired me to revisit my country list. On updating it, I realized that I was well over the 150 mark. That was when I started to consider visiting every country as a real possibility. For the first time, it occurred to me that I really wanted to complete this, and from then on I made a concerted effort towards realizing the goal. Having come so far, it seemed a shame not to. And as you get closer to the final milestone, your determination builds. It's like running a marathon...why stop when you're so close to the end? It’s been a long road, and it’s taken me a good 17 years. As a woman, there were many challenges, and not a lot of precedent to follow. I am only beginning to grasp what the achievement really means, but I’m glad I did it, and hope it will inspire others to reach for goals that initially seem unattainable. 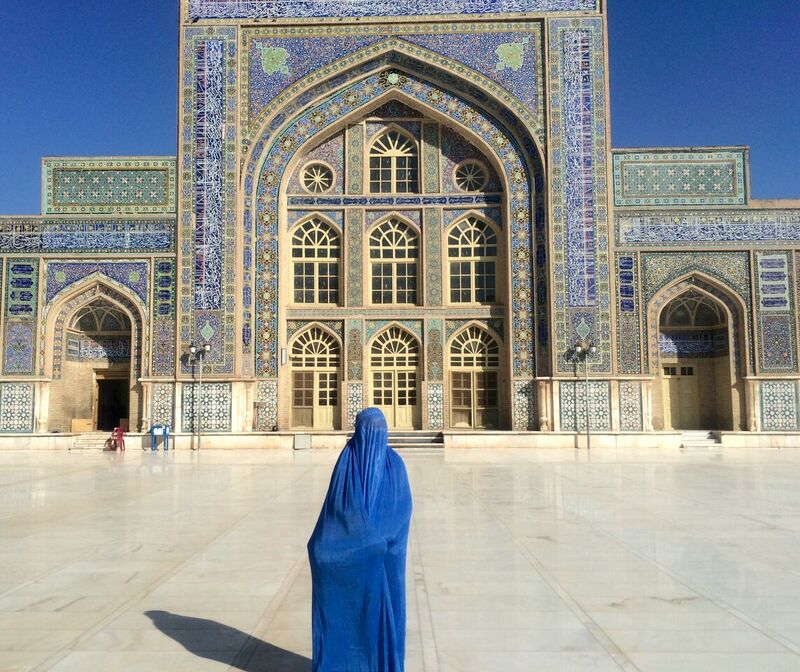 Wearing a traditional blue burqa in Herat, north-western Afghanistan. Did you travel mainly alone? On a budget, backpacking, planning or going with the flow? Of the 200+ countries and territories I've visited, over half were done alone. Most were in Africa and the Middle East. Travelling as a solo female has not always been easy, but it’s certainly been rewarding. In fact, my most vivid travel memories are from journeys I did myself. My first big solo trip covered the Trans-Siberian Railway, the Chinese Silk Road, and the Karakoram Highway through Pakistan before crossing into India. Though perhaps an ambitious route to have taken as a newbie traveler, it remains to this day one of my most memorable experiences. I started out as a backpacker on a tight budget…meaning shared dorms and the cheapest classes of travel on public transport. While not the most comfortable, it definitely helped me cut my teeth as a traveller. These days, I usually pick a mid-range hotel in a good location that affords maximum convenience. Sometimes I splurge on a nice place for a day or two, but I still keep track of my spending. I find budgeting especially important when you’re travelling for longer periods of time. I’m a fan of independent travel, and try to strike a balance between planning and going with the flow. A lot of it depends on where I’m going and how much time I have. It always helps to have a broad game plan with pockets of flexibility built in for contingencies such as inclement weather, flight delays, or lengthy border crossings. I’ve learnt this the hard way many times! 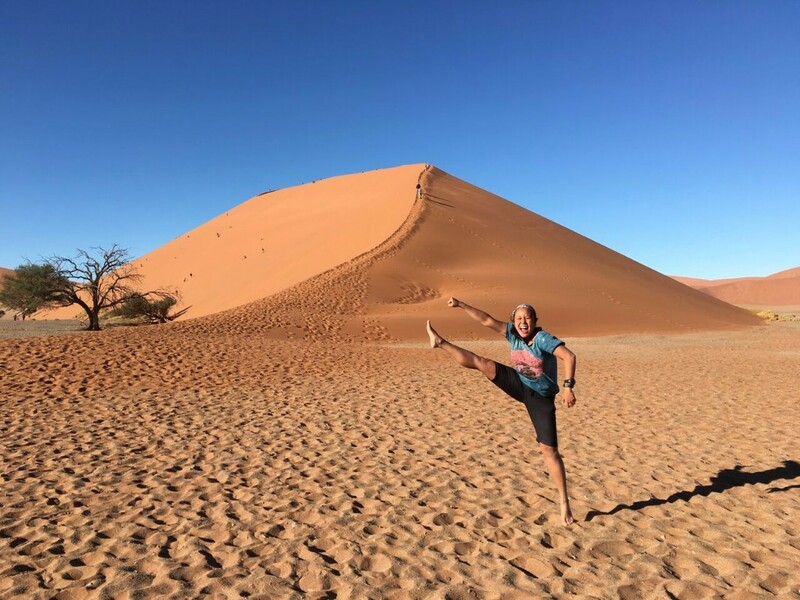 After climbing Dune 45 in Sossusvlei, Namibia. Of all the places you went to which ones were the biggest surprises, good or bad? For me, one of the most interesting things about visiting a country is seeing if the reality of life there matches what’s portrayed in the media. More often than not, it doesn’t! It’s also fun to discover how accurately stereotypes reflect the cultures they represent. The countries that surprised me most, in a good way, were Afghanistan, Libya, and Yemen. These countries evoked the most apprehension when I said I was going, because they’re more known for their troubles than anything else. Spending precious time in each country, however, it struck me that the media depicts only a small part of what it’s really like on the ground. Most people have no idea about everyday life in such places because the ordinary and mundane don’t make headline news. Instead the media tends to sensationalize, over-generalize, or focus excessively on negative aspects, which often leads to further bias and unnecessary scaremongering. This is truly unfortunate, because these are countries of astonishing beauty and wonderful people, and my experiences there proved to be some of the most rewarding and unforgettable I’ve ever had. 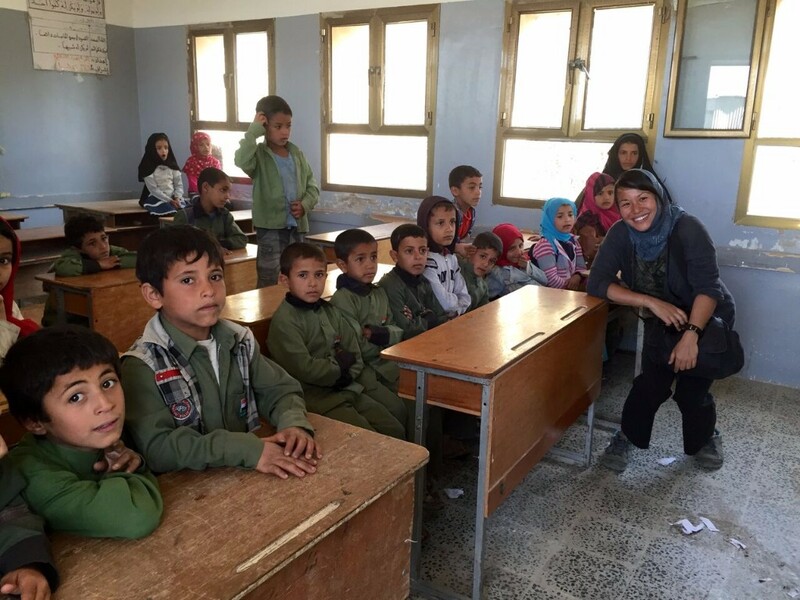 At a village school in the Haraz Mountains, Yemen. Do you have a home base now? What are your feelings toward home and how do you achieve a home-travel balance? My home base is the UK. Although I spend a lot of time away, I do love London. While it doesn’t have the best weather, it can’t be beat for its accessibility and diversity...factors that are important to me. It’s a great base for my traveling lifestyle, and a place I like returning to. It’s also one of those places where almost everyone is from somewhere else, but yet so many people call home. I try to achieve a home-travel balance by breaking up my trips, which usually last between three to ten weeks. I have an understanding partner who has the patience of a saint! Also, running my own business means I’m able to work from the road or plan my work around my travels. I like the flexibility that such an arrangement affords me, but it also requires huge amounts of self-discipline and time management. But honestly “home” to me is more of a feeling than a particular location. I find that I miss aspects of a place rather than the totality of it. I relate to all the different places I’ve lived in, and my identity is made up of a combination of them, rather than just one. And thus, for me, the term “going home" doesn’t just apply to one place…it’s fluid, and, depending on the circumstances, may refer to my place of usual residence, or where my loved ones are, or wherever I feel most comfortable. 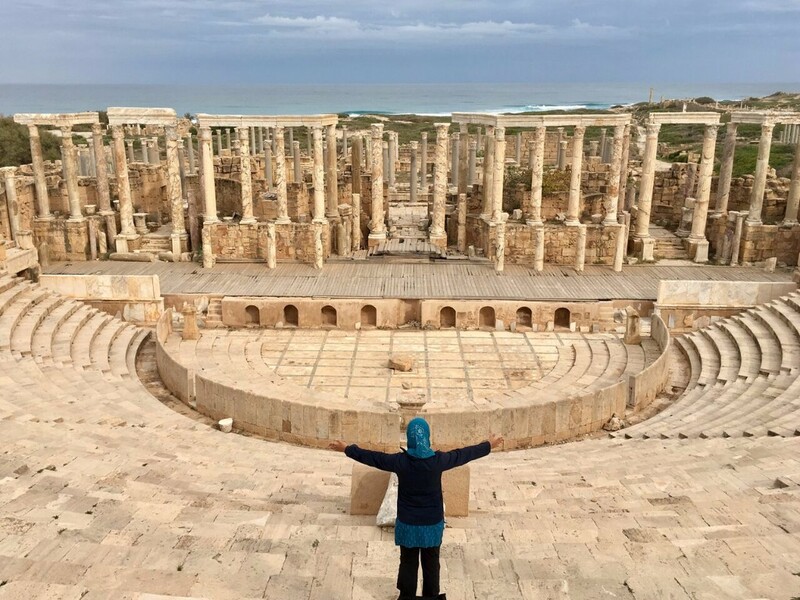 Looking out over the spectacular ruins of Leptis Magna in Khoms, Libya. Now that you have done all countries, what comes next? Oh, lots. There are still islands, cities, and sights yet to see. The thing with travel is that you're never really done, and I don’t think my nature would allow it! I totally relate to the German word Fernweh, which describes a strong urge to visit faraway lands and to have new experiences. It’s sort of the opposite of homesickness. Doing all the countries has given me a really good overview of the world’s regions, and I now have the luxury of being able to revisit those that most interested me and explore them in even greater detail. I also intend to spend more time with those closest to me. My partner is a sports writer, so it’ll be nice to be able to accompany him on some trips to watch live sports. And I continue to pursue personal goals. The great thing about these targets is that they can be as easy or hard as you make them, because you only compete against yourself. Right now I’m undertaking a range of endeavours that challenge my creativity, fitness, and learning ability. 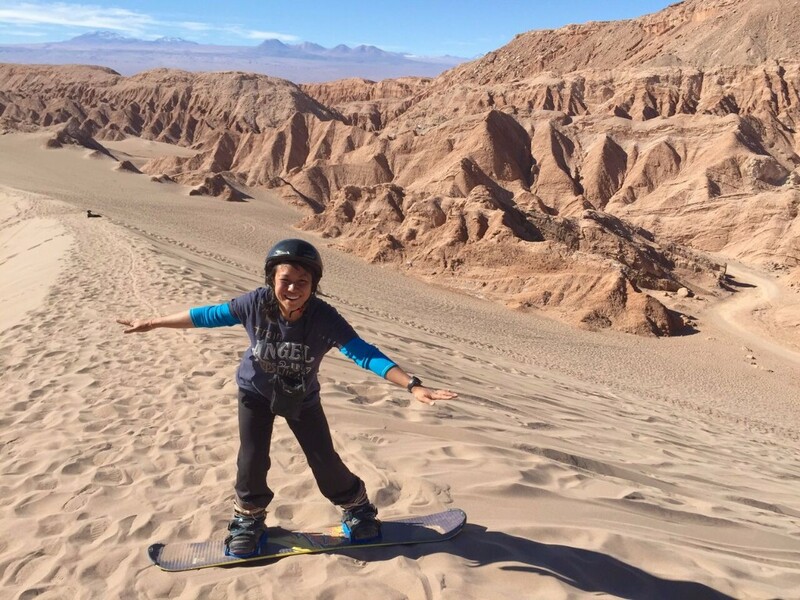 Sandboarding in the Atacama Desert of northern Chile. What do your friends and family think of your endeavour? Haha, good question. I only recently told my family and closest friends, after I completed the countries. Common reactions were “Wow!”, “ALL of them?” and “How many countries are there? !” They think it’s an amazing feat, and my family is proud of me. But most people still don't know. Many friends are aware that I travel a lot, but couldn’t say where exactly. Even my family finds it hard to keep track of where I’ve been! But I guess it’s true that one man’s meat is another’s poison. Whatever goal you have, there’ll always be someone who thinks it’s completely crazy or pointless. Some of my friends and family already thought I was crazy for travelling so much. And they didn’t even know how much! Even while on the road, I rarely brought up the extent of my travels. I liked the anonymity, which I felt enabled me to be a better observer and participant. It was important to me that the locals knew I was visiting out of genuine interest in their culture, and a desire to learn, rather than as a “rich” foreigner blitzing through with the superficial aim of checking off a list. I was especially conscious of this in developing countries. I didn’t want to appear insensitive to those who might never have the opportunity to travel. Some people never even make it out of their villages to the capital cities of their own countries, so who was I to talk about visiting the whole world? I focused instead on getting them to talk about their cultures and lives, which I found very enlightening. 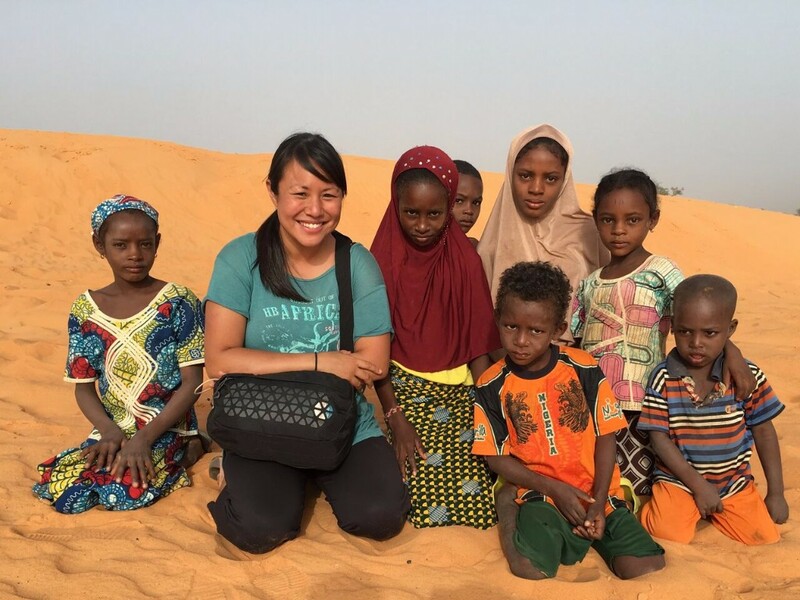 Spending time with local kids on the dunes in north-western Niger. Do you use social media or blog about your travels? Why or why not? I do use social media such as Twitter and Instagram, but only post sporadically. For a while I also maintained a “notes from the road” type blog to enable interested family and friends to follow my travels, but found that posting frequently took up too much time…time I felt was better spent properly experiencing the place I was in. The truth is, I quite preferred “flying under the radar” where only my closest family knew where I was at any one time. This enabled me to change plans and direction as necessary and be as flexible as possible without having to deal with too many questions or explanations. Many people are surprised that I’ve spent so much time and energy travelling but haven’t put a similar amount of effort into publicizing the fact. I think it goes back to my point about travel (in particular extreme travel) being such a deeply personal endeavour that not everyone can relate to. The overarching aim of my travels has been to learn and educate myself, while giving back to local communities as much as possible. Gaining recognition is more of a bonus than a priority. That being said though, if the travel achievement generates interest I am happy to talk about it and use it as a platform to help others. I also have projects in the pipeline that will leverage the experience I’ve gained as well as the notes and footage collected through my years of travel. With the Huli people in the Tari Highlands of Papua New Guinea. What have you learned from all this? Do you feel much changed compared to who you were before travelling? Yes, plenty. Travel has given me the best all-round education I could ever have asked for…over and above my academic degrees and professional qualifications. It’s improved my knowledge in such a range of areas: history, geography, anthropology, politics…the list goes on. Places you hear about become all the more meaningful once you’ve been there. Countries, food, religion and culture all take on a greater significance when you’ve experienced it firsthand. I find this helps me relate to almost anyone I meet. People are always so pleased when they say where they’re from and I say I’ve visited their country. It’s a great icebreaker. As I was fairly young when I started travelling, I’d say that travel contributed significantly to defining who I’ve become. It’s been an intensive, hands-on course in all kinds of life skills, like self-reliance, independence, and how to be resourceful. It’s made me step out of my comfort zone and become aware of the world around me, which has influenced many aspects of my life and really boosted my personal and professional development. Interestingly, travel teaches you not just about foreign cultures but also about your own. I’ve definitely become much more cognizant of my cultural heritage and the social groups I represent, and how to explain or confront stereotypes about them. Also, travel really puts things in perspective...the more of the world I see, the more I truly appreciate all the blessings I have. Overall I’d say travel has been a real privilege. Given the amount you learn, it should really be a compulsory subject in the ‘school of life’! I feel so much richer than before; not in terms of money but in knowledge and life experience, which to me are priceless. 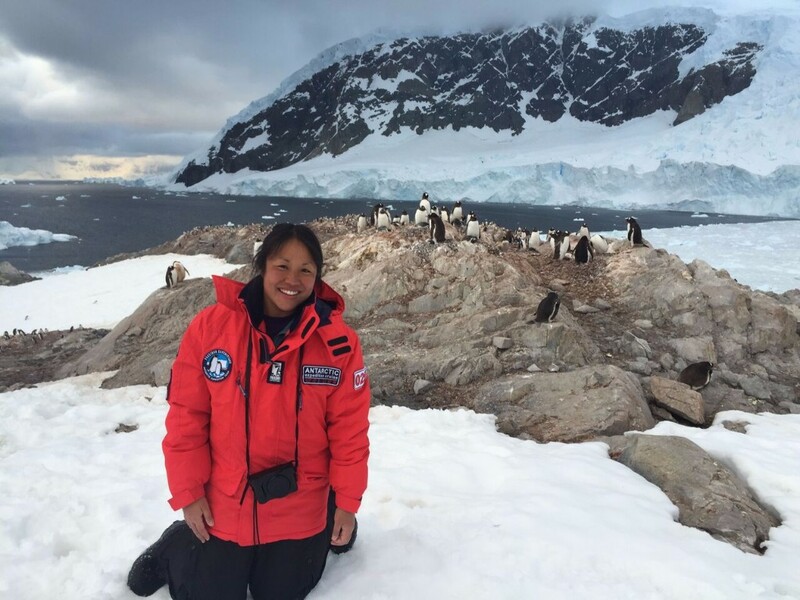 Chilling with the penguins at Neko Harbour, Antarctica. Finally, if you could invite any four people to dinner who would you invite and why? Hmm, that’s a hard question! Can I have two goes at it? My first thought would be to pick four people who all have something in common, say, travel and writing, so dinner conversation would flow well. In this case, I’d pick Michael Palin, Pico Iyer, Paul Theroux and Jon Krakauer. I’ve read works by all of them, and would love to hear their travel stories in person. Michael Crichton – writer, producer, director: What a brilliant guy. Many of his books have been made into films including Jurassic Park, but the one that’s stayed with me the most is his nonfiction work, Travels. I particularly remember the chapter on Kilimanjaro, which inspired me to summit the mountain myself. Deborah Tannen – academic, sociolinguist: I’m a bit of a language geek who’s interested in linguistics, discourse analysis and communication styles. I’ve read Dr. Tannen’s work since my university days and am keen to learn more about how she conducts her research, particularly in cross-cultural situations. Tim Ferriss – author, lifestyle design guru: Tim is a fascinating person with a diverse range of interests, from language learning to fitness to technology. He really knows how to capture the zeitgeist and has taken the concept of lifestyle design into the mainstream. Many of his ideas are quite inspiring. P!nk – singer, songwriter: I’ve always found Pink cool and easy to relate to, perhaps because we’re about the same age and she hails from Philadelphia, where I went to school. I admire her artistry and would love to chat about her songwriting process and life in general. And if the opportunity to jam came up, I’d take it! 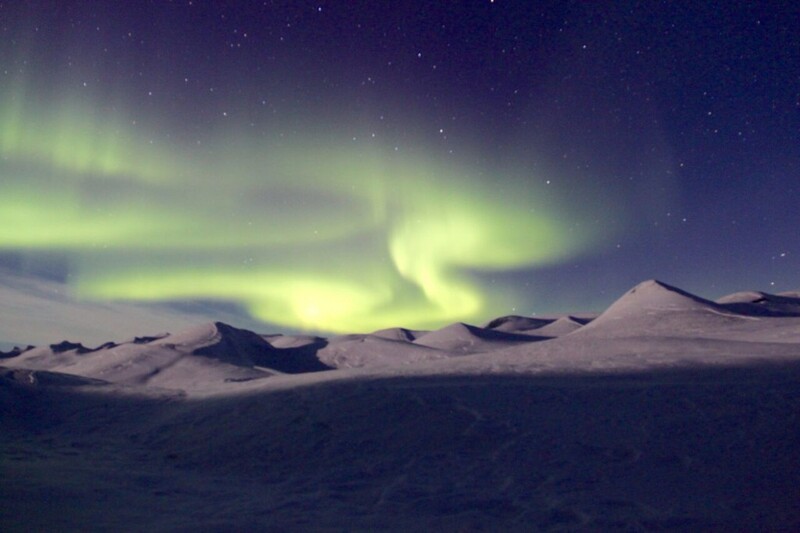 Brilliant display of Northern Lights while camping on the Greenlandic ice cap. The photos in this interview are from Yui's personal collection and we thank her for sharing them with us at NomadMania!